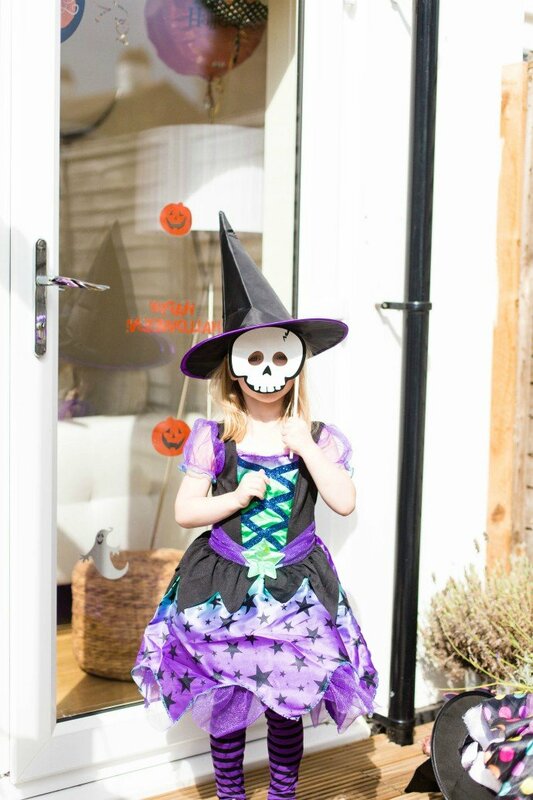 Halloween has become a big event in our house, since having children. My girls love dressing up for Halloween and they even help me put up the decorations. Of course this means that often you will find decorations in the most unusual places but it’s all part of the fun, isn’t it? 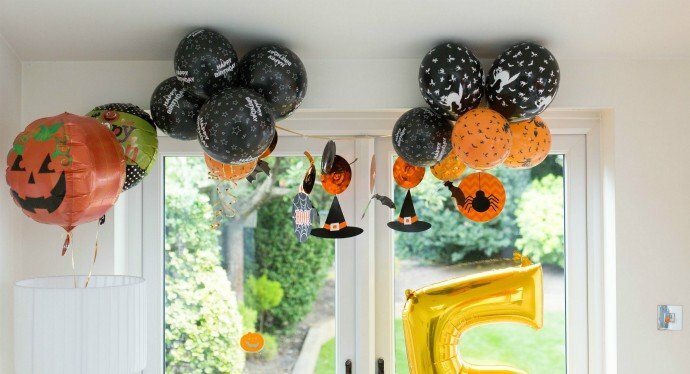 My daughter was born near Halloween, so I’ve often thought about throwing her a Halloween themed birthday party. 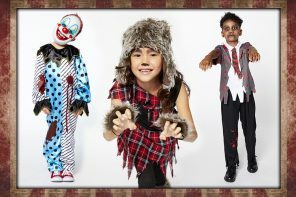 Kids love Halloween and it’s also a great excuse for everyone to dress up. 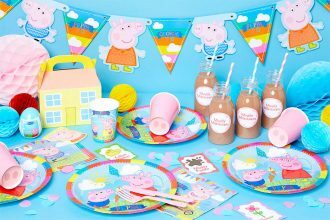 Themed birthday parties are also easy to plan because you can buy all the party supplies from one range, or you can mix it up a little bit if you want to. It’s totally up to you. Halloween is one of those occasions when you cannot have too many decorations in my opinion. You can never have too many balloons either. In fact, you’ll find balloons almost in every corner in our house. 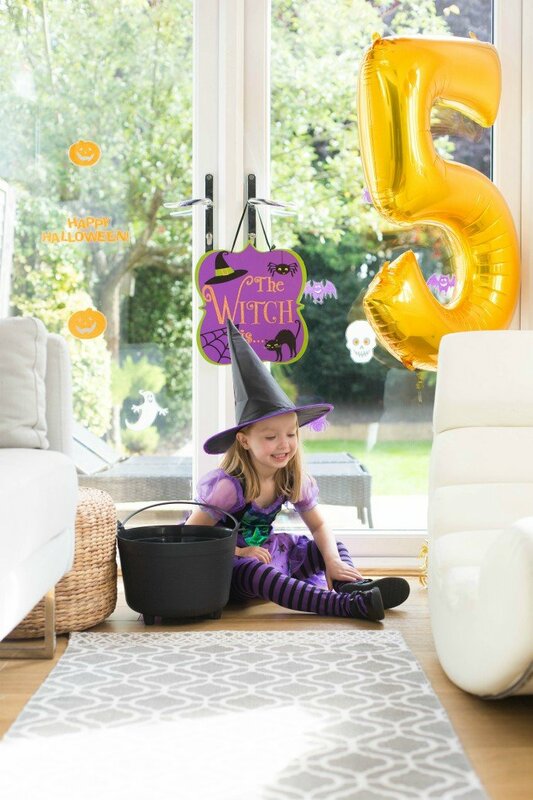 These cats and witches balloons are perfect for kids Halloween parties and I love that there are two different colours in the pack. 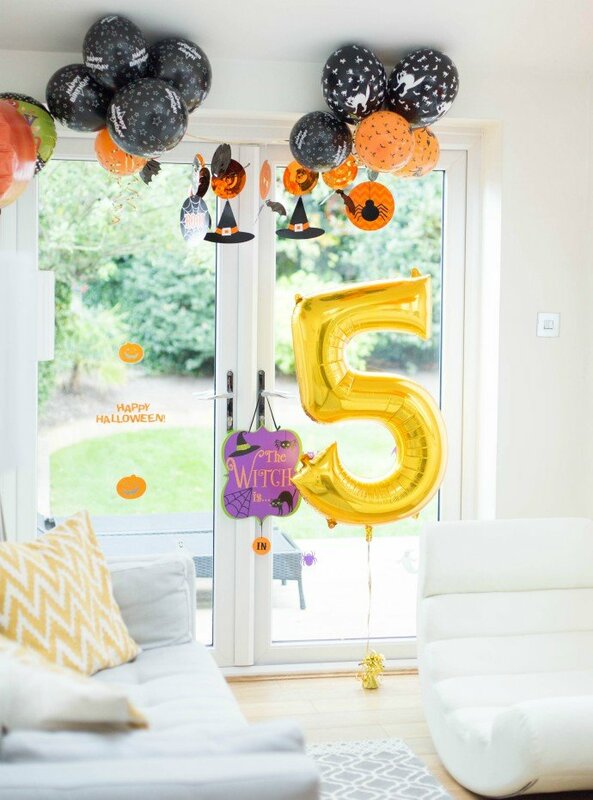 These black happy birthday balloons are ideal if you’re going for a black and orange Halloween theme. I love the floating balloons effect but I hate it when the balloons keep moving sideways. So, I decided to use plastic balloon hangers to stop them from moving. It worked like a charm and you can reuse the hangers which is handy. I accessorised some of the balloons with curling ribbon but you could always just let them float on their own. I also got through two helium canisters, so if you want your balloons to float, make sure you’ve got enough helium. I’m still obsessed with gold, so a giant gold foil number balloon is a birthday party must-have in our house these days. 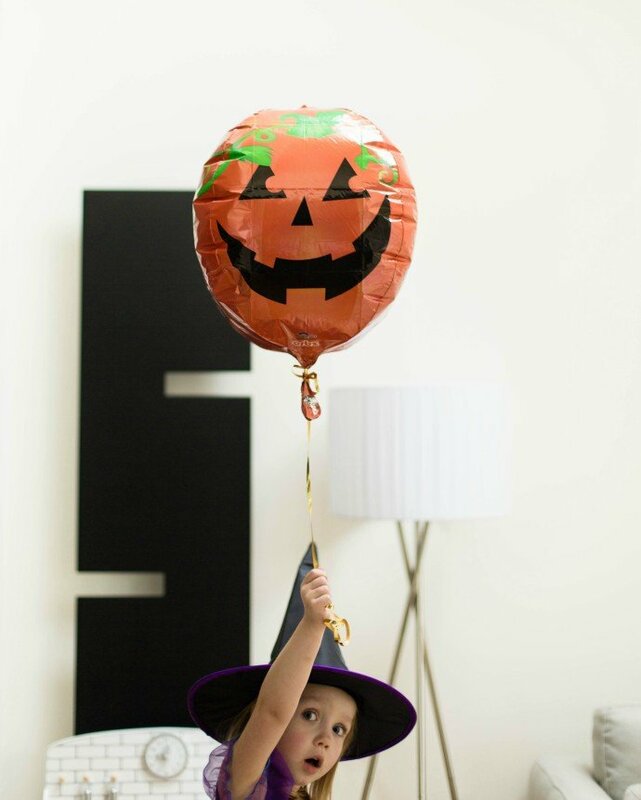 You could easily make it the centre piece too, or get a smaller size number balloon and place it on a side table next to some mini pumpkins. 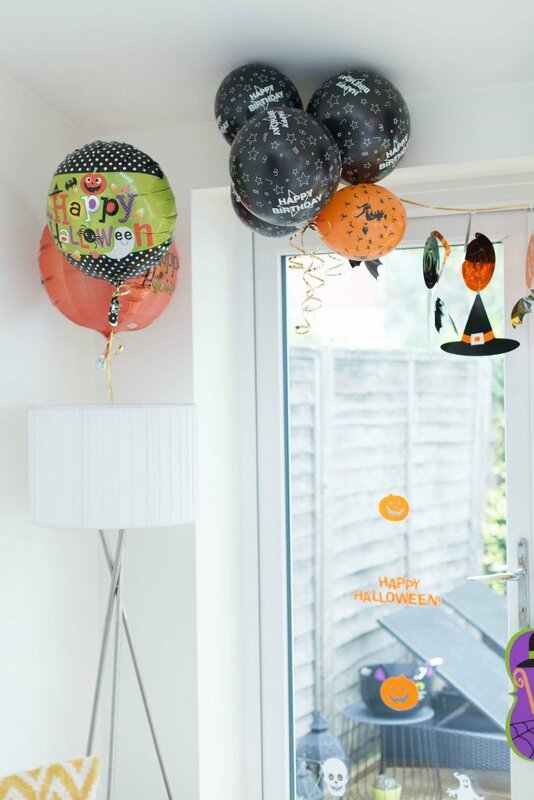 This Halloween polka dots balloon and this pumpkin orbz foil balloon will beautifully suit a fun and colourful birthday party. These kid-friendly hats and bats hanging swirls look stunning on their own or place them all on a long string like I did, so that they sit perfectly in the middle. 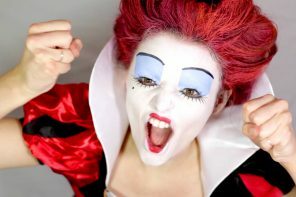 Now what would Halloween be like without any pumpkins? 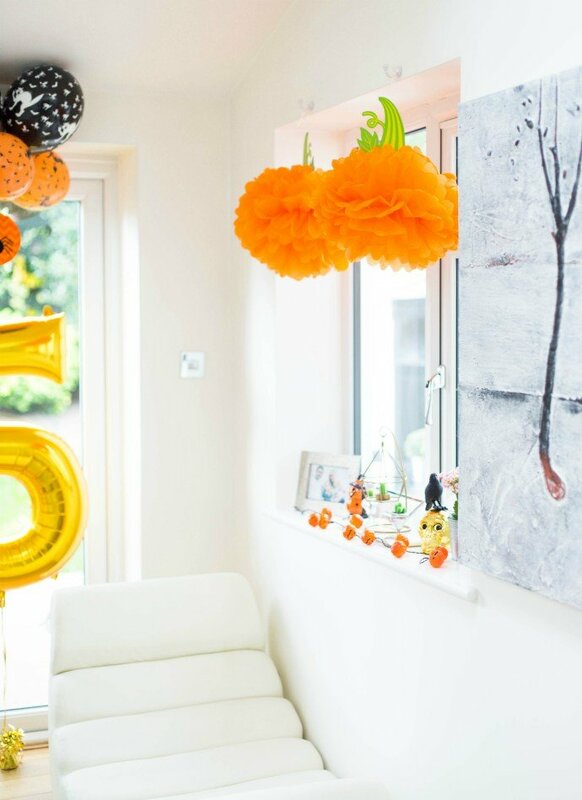 These pumpkin pom pom decorations are perfect for setting the scene and they are really quick and easy to assemble. 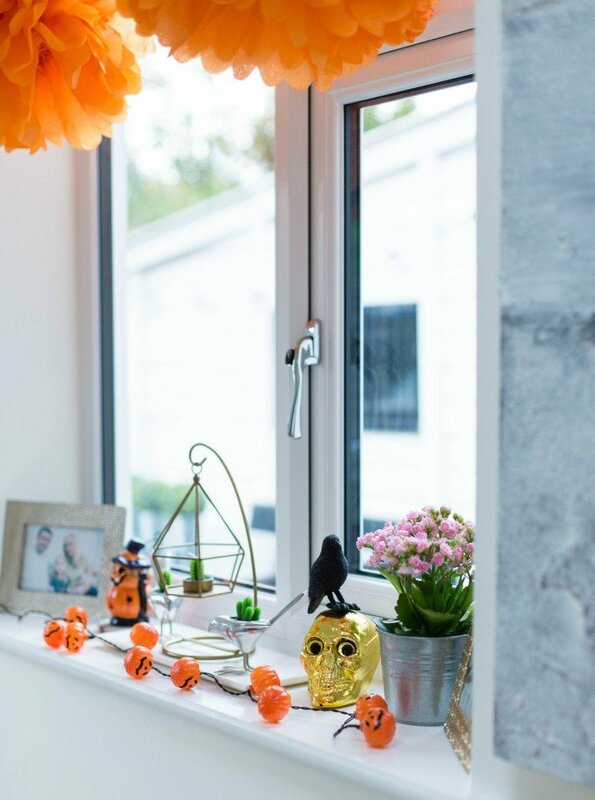 I’m also loving these LED pumpkin string lights which are great for spooking up your window sill. 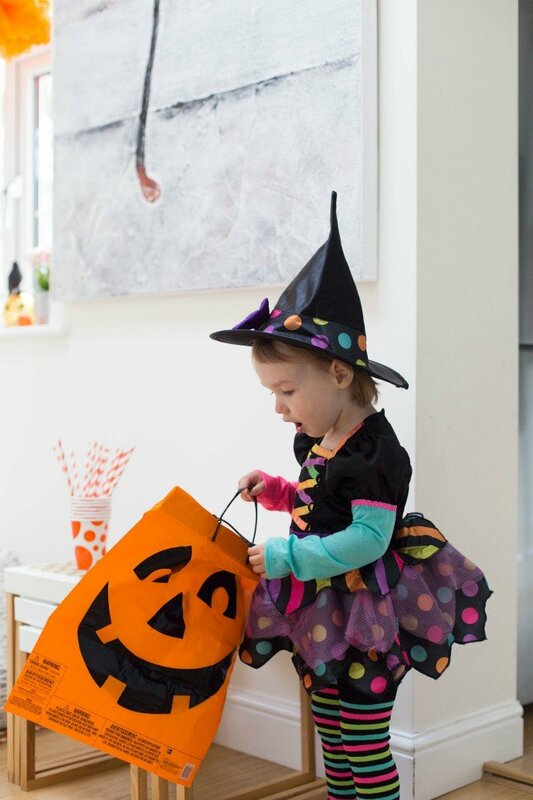 Battery operated candles are a lot safer around children than real candles which is why everyone will love this battery operated pumpkin lantern. The witch is in/out sign might just be my favourite Halloween decoration ever. I love the vibrant colours and that you can rotate the in and out sign. 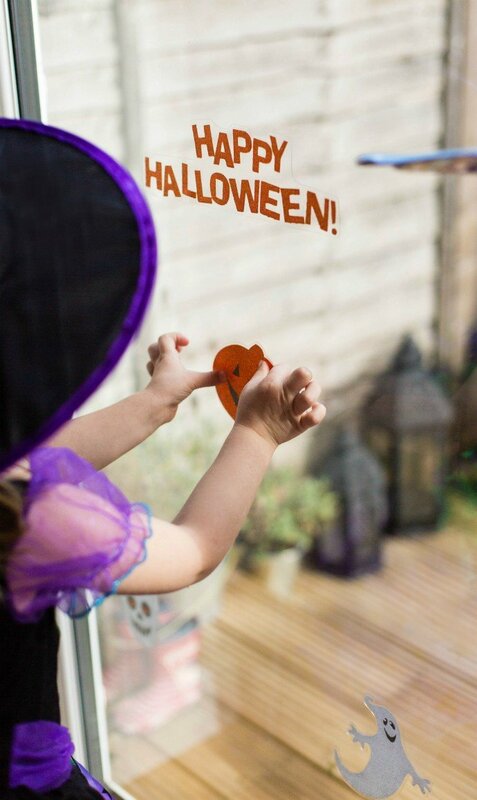 These glitter window decorations were also a big hit in our house. 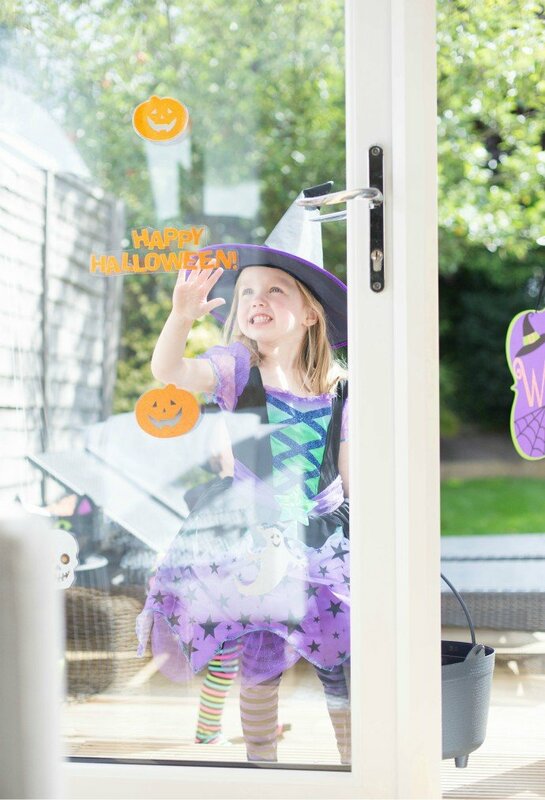 My daughters helped me to stick them on the double doors and it turned into a big game once they realised that the stickers can be used over and over again. 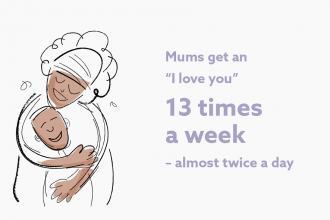 I think we spent half an hour just doing that! These witches crew round plates are perfect for Halloween treats and I love that you can get matching invites too. 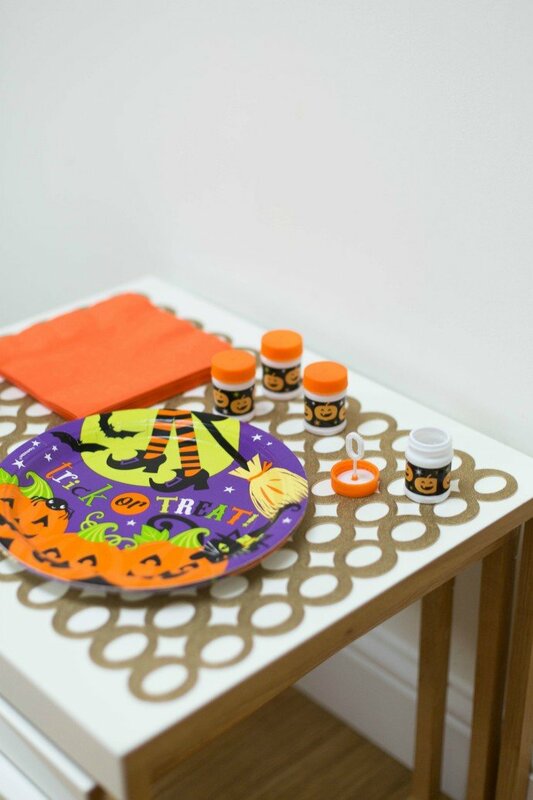 The orange dot cups, napkins and the orange paper straws are suitable for any occasions, but since orange is the official colour of Halloween (with black of course), I thought they’d look great with the witches crew tableware. 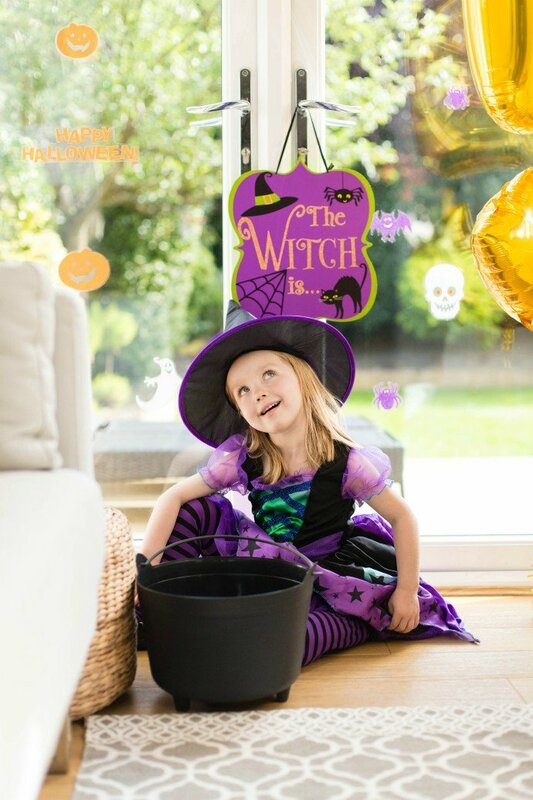 Leave some Happy Halloween bubbles on the tables or place some in the pumpkin treat bags to surprise your guests later. 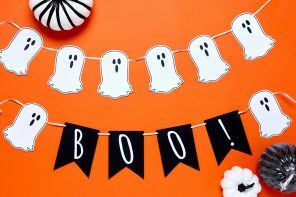 These Halloween photo booth props are also a bit of fun and will help your guests strike a pose for the camera. 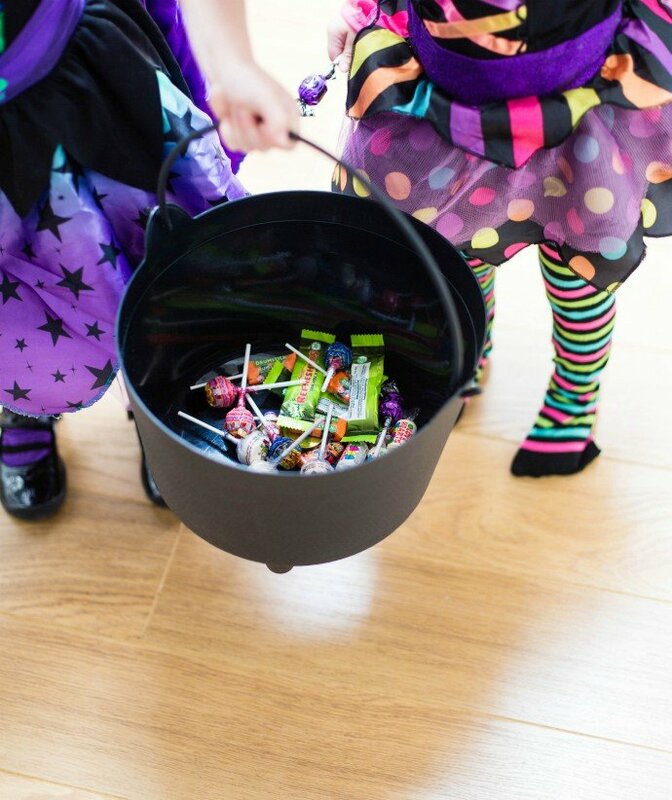 This black cauldron is ideal for collecting Halloween treats or you could also fill it up with party food. 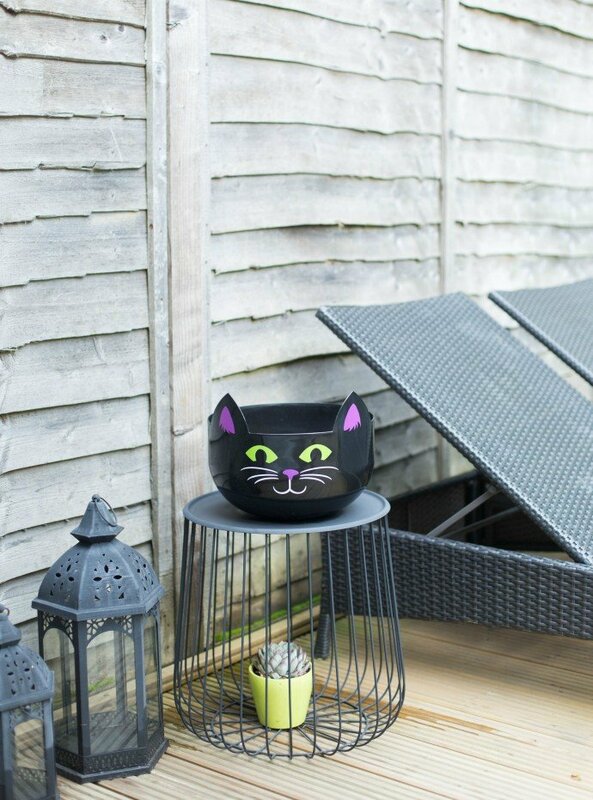 This spooky cat bowl will look great on the side table outside or place it in the centre of the dinner table and fill it with snacks. 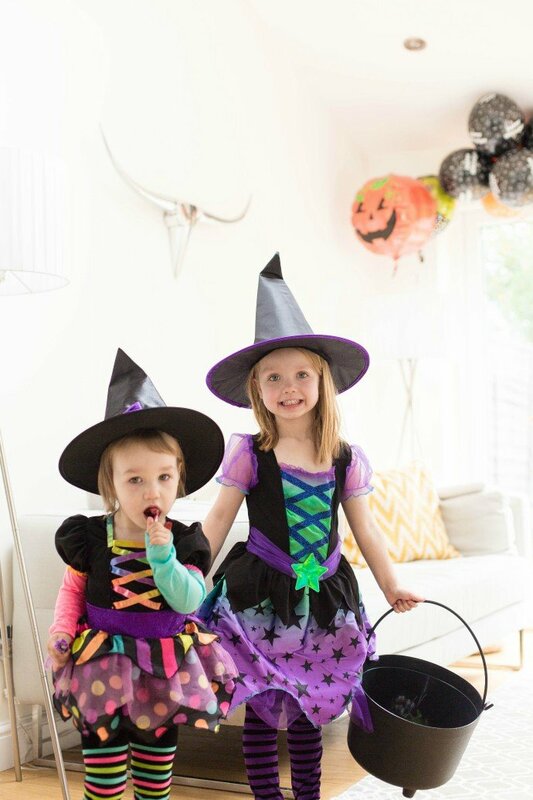 And finally, how amazing are those witches outfits? My eldest daughter announced months ago that she wanted to be a witch this Halloween, so this was definitely a dream come true for her. 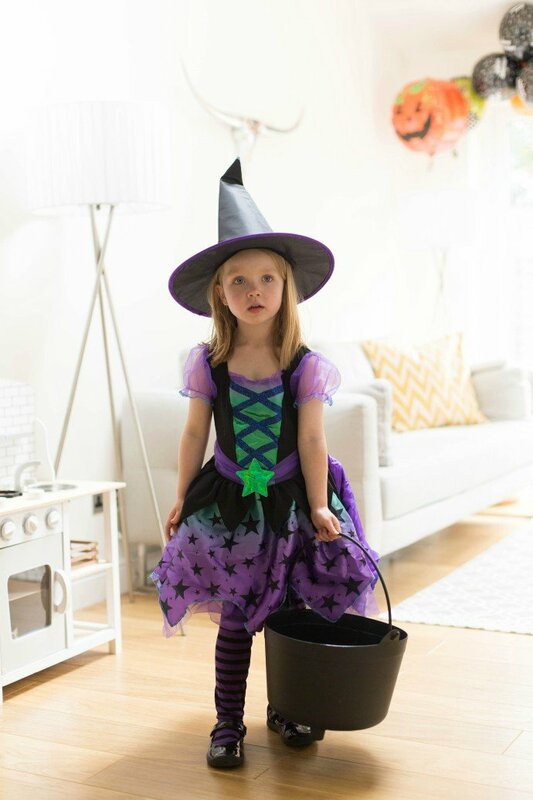 The spell casting cutie witch costume with the purple/black tights looked adorable on her. 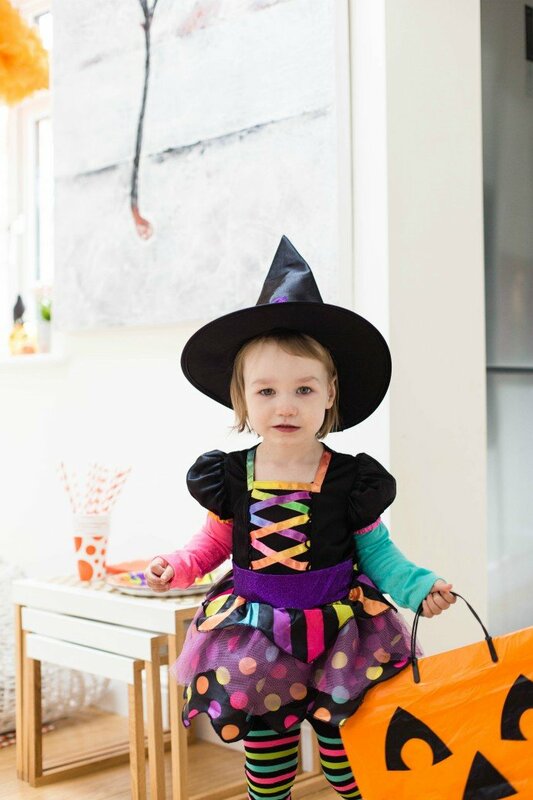 The colourful mismatched witch outfit on the other hand was perfect for my feisty two year old. 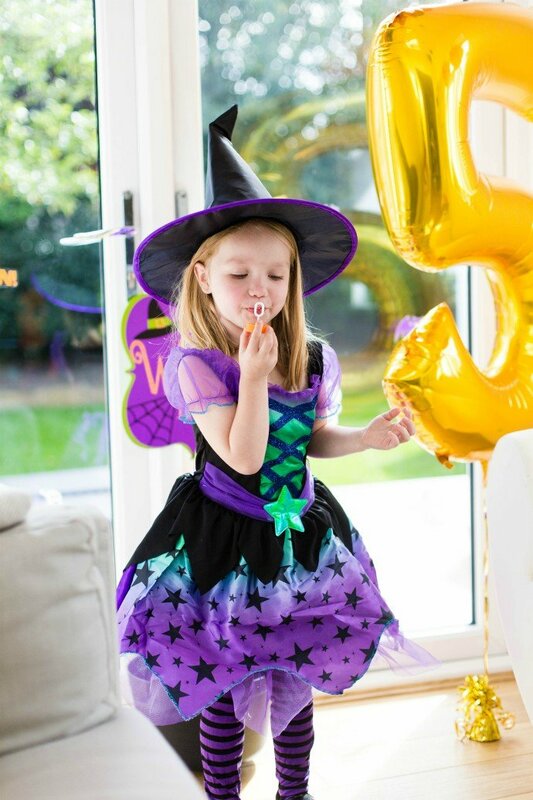 My girls had such a fun time dressing up and it’s safe to say that our Halloween birthday party photo shoot has gotten everyone excited about Halloween. 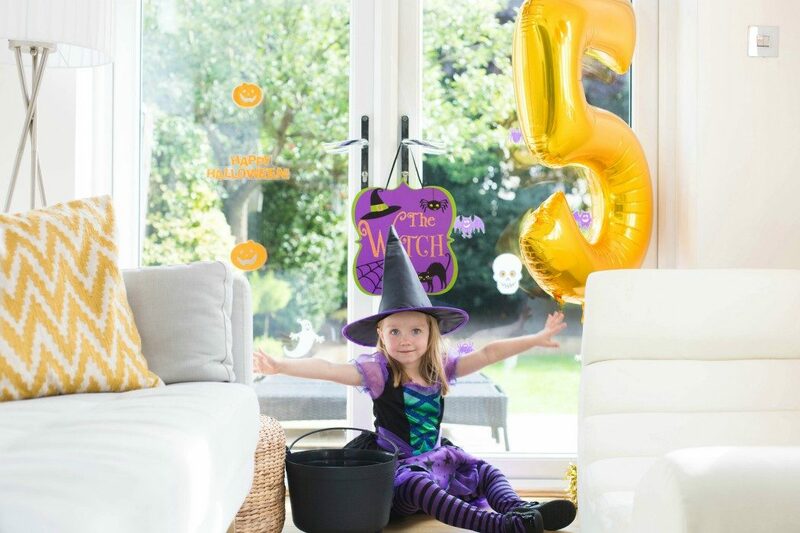 I hope that I’ve inspired you to throw a spooky Halloween themed birthday party this year. 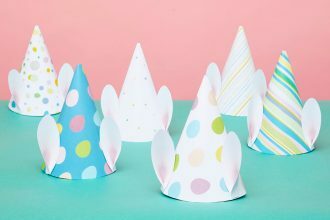 Children parties are always fun and with the right decorations, costumes and activities your party is bound to be a success. Pia Orr is the inspiration and writer behind "Finnterior Designer", a website that's all about home decorating, interior inspiration and entertaining. 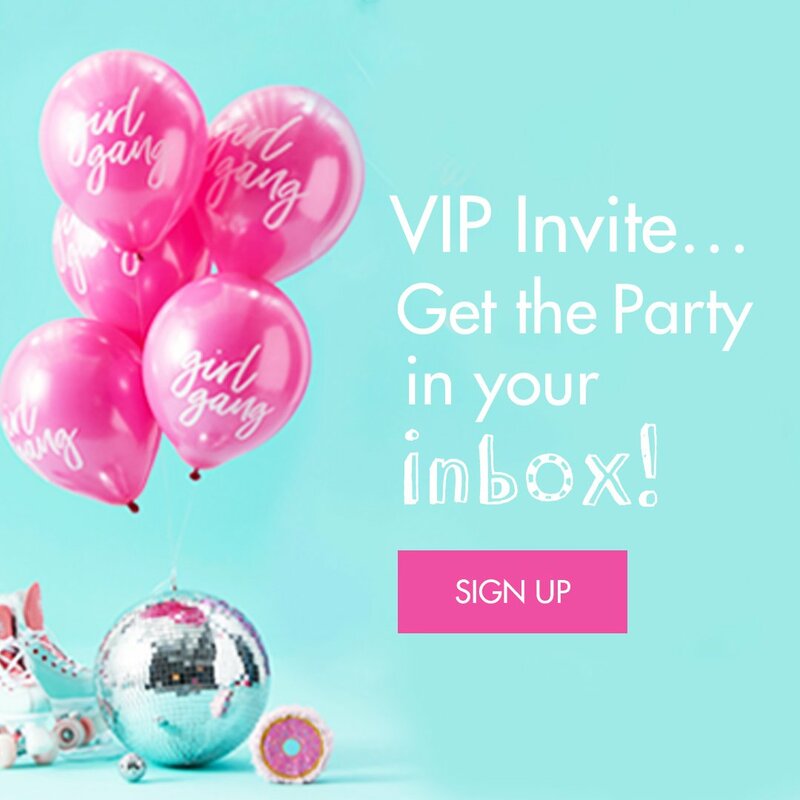 Pia loves throwing stylish parties and creating pretty tablescapes. Photography is also a big part of Pia's blog which is why she prefers to shoot most of the images herself.